With some math, some simulations, and one infographic, Mr. Robot showed how losing Master Loot has almost no impact on your personal or team’s progress (outside of split raids, of course). Blizzard announced that guild raids will no longer have a Master loot option – all loot will be Personal loot. As it stands right now – on Personal loot if you win an item that is a higher iLevel than any other item you own for that slot, the item cannot be traded. If the item is equal or lower iLevel, it can be traded. It was not to take away split runs, however, they mention that is a welcomed side effect. (A split run is where a team takes their roster of 20 and split them up into 4 farm teams, for example. Each team consists of 5 ‘real’ players and 15 alts. All items that drop are Master looted to the 5 ‘real’ players, allowing the team to gear up faster). This change is pretty controversial. A lot of people really love it, or really hate it. The Warcraft developer Q&A on Thursday spent the first 15 minutes talking about the off-GCD change. It’s probably the most controversial change so far. Let’s take a look at what this change is, why Blizzard made it, the possible downsides, and how it might impact gameplay. What is the Off-GCD ability change? If you haven’t had the chance to keep track of all the changes in the BfA alpha, the Global Cooldown (GCD) has been one of the biggest. In the alpha, some abilities that were not on the GCD were put back on the GCD. You might see this referred to as off-GCD or OGCD. Link to the Video, queued up to the GCD discussion at 15:48. Update on May 10: Blizzard announced they are taking some racials and on-use trinkets back off the GCD. That seems like a simple change, but it definitely affects a lot of different aspects of the game. The latest developer Q&A addressed the reasoning behind this decision. Why did Blizzard make this change? Legendary gear suggestions – why are they sometimes unusual? You then start to wonder if Mr. Robot is drunk or just trolling… you have the best legendaries, why isn’t he recommending them? Mr. Robot takes into account all of the gear you own, including the iLevels on all of your gear. If you have a really low iLevel slot, sometimes it is best to replace it. Sometimes the best legendaries for you right now are not the same as a ranked list of legendaries, even if you own them all. Toxicity is a real problem in some of the class Discords. Earlier this week I posted an article that tried to shed some light on it. But since I posted some statistics in aggregate, lumping in the good Discords with the bad, many Discord moderators got really upset. I understand why they were upset: they want to distance themselves as far as possible from these toxic people and it isn’t fair to be associated with this bad behavior. Because of this, I took down the original article – iIt wasn’t fair to lump them together, implying that everyone was engaging in poor behavior, instead of just a small group. That outrage is encouraging – most people don’t want this toxicity. Regardless of the poor execution of my first article, the toxicity is there. The problem that prompted the article still exists and so I am going to continue to address it. Why me? Why is AMR posting this? How bad are some of these channels – are people just overreacting? In this article, you will see quotes with racial slurs and homophobic remarks. I have blocked out names and icons, replaced with their Discord rank (moderator or expert), as well as identified if someone is a “Regular.” A Regular is defined as one of the handful of people in the ‘in-crowd’ who account for 75% of daily messages in the spec channels (on average). Anyone labeled as a “user” either just dropped in or has very little participation. The script scales with the custom fight duration you put in. Phase 3 lasts until the boss is at 25% health. Phase 4 (Apocalypse Drive) lasts for 20 seconds. This article describes the default script. I also have variations that may interest you. While the scripts are totally customizable, the user interface isn’t as friendly or self explanatory as we normally present. So if you have a request for a variation, let us know in Discord or our Forums. To use a custom script, click the link and then click the ‘add to my list’ button at the top of the page. You can then select it in the boss menu on the sim setup page. For ranged players who aren’t good at the ‘run and gun’ while moving, you’ll find you lose DPS compared to the default script. Try this script instead, which assumes you lose some spell casts while moving, “Garothi (H) – Move it.” I actually like to sim myself using the default and this one to see how much DPS I can gain if I practice dps’ing while on the run. Bloodlust happens at the beginning of the fight by default. These are little green puddles that 1-3 people have to stand in to soak damage. The number of puddles spawned scales with your raid size, averaging about 1 zone per 4 players. In the script, we assumed melee have a 20% chance to have to soak a puddle, based on placement or absent minded ranged. We assumed 100% of ranged will soak, allowing melee to stay in range of boss when possible. When players are targeted they have to run far away before the decimation is dropped, then continue to run to get out of it. The number of targets scales with your raid size, where DPS and healers have a 28% chance to be targeted. In the script, if melee get targeted, we assume they are out of range of the boss. If ranged get targeted, we assume that 10% of the time they will be out of range of the boss, and 90% of the time they will maintain range on the boss while running. Assume 2.7-3.3 seconds of running (for ranged) or losing range of the boss (for melee). This script has you killing the annihilation weapon first, since that appears to be the heavily favored strategy. This is the green strip that appears during Apocalypse Drive. Very small amount of movement, 0.8 – 1.2 seconds to move a few steps. This is a raidwide AoE that does less damage the further away you are. So people run to the back of the room. More people are targeted during the empowered version of Decimation, such that you have a 42% chance to be targeted and required to run. Assume 2.7 – 3.3 seconds of run time and loss of range of the boss for melee. Phase 4 repeats to mimic the previous Apocalypse Drive. And phase 5 is a burn to take the boss down as fast as possible. That’s right – stat weights are so last-gen. They are actually more like the iPhone 4… they barely work anymore and definitely can’t play any of the new games. Stat weights only rank the stats on your items and don’t rank any procs. That means they don’t rank procs from your relics, legendaries, trinkets or set bonuses. Thats… uh, half your gear! If a system can’t rank half your gear, it is time to retire it. Even though some of our Moms still have the iPhone 4 because change is scary, it doesn’t stop us from trying to show them why a newer model is better. I talk more about this in the video below (stat weights, not iPhones) and I also explain the new system that solves the problem. (Look at my face, SO SERIOUS!) If you like videos… /highfive. If not, keep reading and you’ll still get the most important points. Tanks are getting a lot of love from Mr. Robot recently. Here’s a summary of what you need to know to sim and find the best gear. Our most advanced feature is one that tanks have for the very first time in Warcraft. Crazy, right? That even over 10 years later, there are new things to help you gear. No problem, we have always helped you gear for that. But then when happens when you are crushing content (or maybe just smack talking because they don’t hit as hard anymore)? You probably find yourself ditching some tanky gear and looking for DPS stuff instead. That’s where the “Blender” comes in. You determine how tanky you want to be, and where the tradeoff is for adding DPS gear and stats. Maybe you like to be 100% tank, all the time. Maybe you like living on the edge and getting juuuuust enough defensive gear and then putting the rest into DPS. I’m not here to tell you how to play… I’m here to help you play how you want to play. To use the blender, click on the gearing strategy picker to the right of your character name at the top of the gear optimizer page. The Blender appears at the bottom of the popup. First of all, the credit for this script goes to Woedenaz (follow on Twitter & Twitch). He is working on some tank theorycrafting and wanted to start with some solid scripts for Antorus. Woedenaz scripted F’harg because it is the harder hitting of the two Felhounds, and there are no tank swaps. This is a very magic-heavy tanking scenario and your death chance will probably be pretty high unless you have 930+ gear. If you have questions or feedback about this script, the best option is to catch him in the AMR discord, or on this forum thread. Also, check out the other things we have for tanks on this blog post. NOTICE: This is based on the PTR version of the fight and only a handful of logs. Anyway! To give you the best gearing advice, you have to trust the simulation engine behind it. How do you know Mr. Robot’s simulator is giving you accurate results? Great question! We can compare simulations directly to logs, since we use real boss fights. Real player + real boss = verifiable results. When you can simulate a top player and the report matches the log – you know the system is spot on. I am proud to tell you that simulations match top logs for all DPS specs! Spell abilities – is the damage correct and are they affected by the right buffs? Rotations – do our rotations reflect what top players are doing? Special items – is the damage and proc rate matching on special items? Boss strategies – are some people using a different strategy or positioning? If so, we make modified scripts. Each log is imported into our simulator, exactly matching the fight length, talents, gear, and buffs that the character had on that fight. Get Ready for ULDIR – for FREE!! 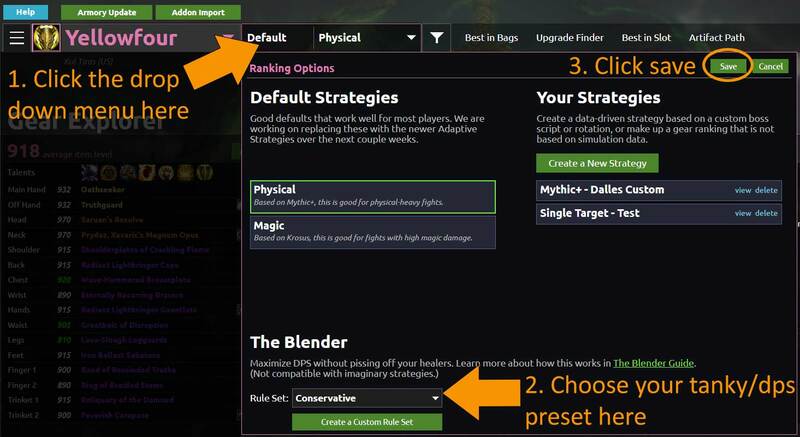 We provide World of Warcraft players with data-driven, actionable advice. We spend our time doing research outside the game, so you can spend more time having fun in game.